CEM Professional Edition (CEM- PE) is the personal computer version of the CEM and is a fully interactive, multi-media resource, containing programmed formulas, live/interactive graphs, and animated visuals. 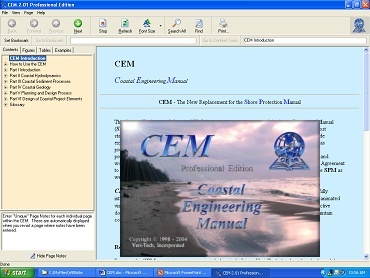 CEM-PE is a Windows-based CD-ROM document that incorporates all the tools and procedures used to plan, design, construct, and maintain coastal projects. CEM is a comprehensive, state-of-the-art guide including the basic principles of coastal processes, methods for computing coastal engineering planning and design parameters, and guidance on how to formulate and conduct studies in support of coastal flooding, shore protection, and navigation projects. CEM Standard Edition (SE) contains all the material in CEM-PE except the capability of using the programmed example problems and equations. This version is designed for general use as a reference or instructional material and is priced substantially lower. CEM-SE is only sold with a hardware key. Click here to view a listing of all Parts and Chapters. Also included free on the CEM-PE CD, is the model SBAS (Sediment Budget Analysis System). SBAS provides a framework for formulating, documenting, and calculating sediment budgets, including estimation, of uncertainty and representation of multiple inlets. Part V of CEM-PE includes comprehensive information on calculating sediment budgets using SBAS. Because the CEM relies on the user having access to recent versions SBAS, Veritech is providing SBAS free of charge.